9-shot .22 caliber singlearid double-action revolver dollar for dollar—and in every way—your biggest Western handgun buy! See it at your dealer's, or write for full-color catalog E97. Faster than any other Western-style handgun because it fires 9 shots both double and single action. • Only the Double-Nine has single-stroke multiple ejection for faster reloading — plus the safety of rebounding hammer with automatic safety block • Select high-tensile steel barrel and 9-shot swing-out cylinder • Superbly engineered modem action of unsurpassed smoothness already proof-tested in thousands of Hi-Standard's famous Sentinel revolvers • Handles all .22's magnificently — shorts, longs. 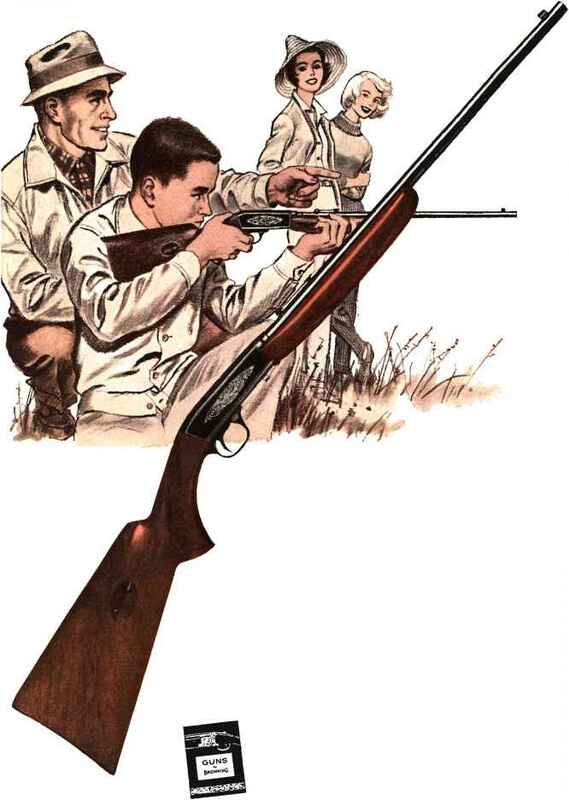 WRITE for "Guns by Browning" a colorful illustrated booklet containing complete information on all Browning guns and special chapters on shooting. Browning Arms Co., Dept. 31, St. Louis 3, Mo. U.S.A. Browning Arms Co. of Canada, Ltd. Dept. 31, P.O. Box 991, Montreal 9, P. Q. Age 12 or 60, you'll handle it like a "pro" from the first shot. Light weight and precise balance make good shooting easy — even fast shooting, at the toughest target. You'll appreciate the slender lines and compact action, yet feel secure in its rugged strength—the Strength of Finf. Steel throughout, carefully Aa/i</-fitted for dependable, lasting performance. The polished surface is as durable as it is handsome; even the select French walnut is Aan^-finished. And, as a final mark of rare craftsmanship, the receiver is richly hand-engraved. Ideal for family fun, the Browning goes everywhere. The barrel and stock separate to a length of 19 inches in 3 seconds... to fit knapsack or bedroll or tuck away in any corner. It assembles as quickly. Most important are its safety features: an action completely encased in solid steel, loading port in the stock, safer bottom ejection, large cross-bolt safety, and disassembly for safer storage.